I haven’t baked bread in ages. Pity because as soon as I had that dough in my hands it was therapy. Warm, doughy therapy. For any of you in the need, forget spending hundreds of dollars on specialists. 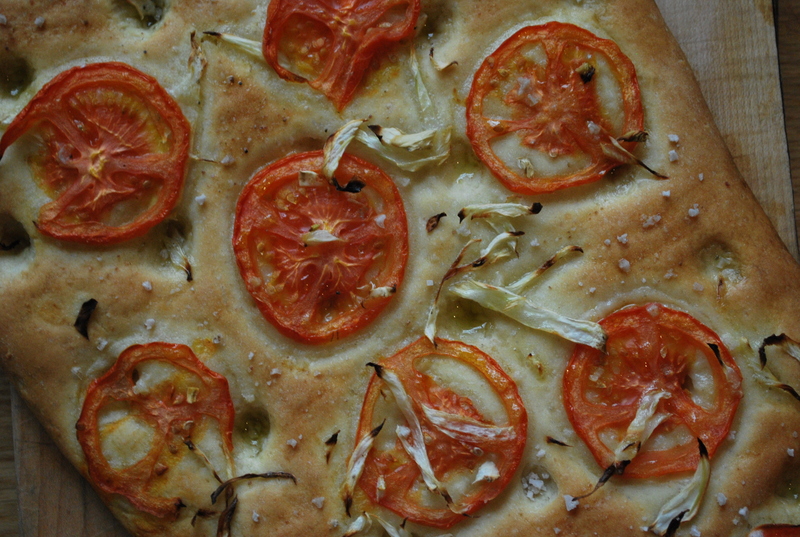 Just make focaccia. Then eat it. That’s all the therapy you need. And there’s no end in sight – this one boasts fennel and tomato, but anything will do. Onions, olives, different kinds of salt, herbs, thinly sliced potato. You name it. It goes with focaccia. One immediate improvement I would make? Put herbs in the dough – maybe a little thyme or basilico right in there for the baking to imbibe the whole thing with the scent and taste of those power-packed little greens. For the dough, sift the flour and salt into a large bowl and add the yeast. Stir to combine and make a small well in the centre. Add water and 2 tbsps of olive oil. Quickly stir a few times just to combine, then use your hands to bring the mixture together. (If the mixture is sticking to your hands, add a little flour, but avoid using it if at all possible as adding too much during the kneading process can make the bread chewy). Transfer the dough to a lightly floured counter and knead for 8 – 10 minutes, until smooth and elastic. Form the dough into a ball and put it in a lightly oiled bowl. Cover with a kitchen towel and let sit in a warm place for 1 1/2 hours, until doubled in size. Preheat oven to 425 degrees. Put the ball of dough on a lightly oiled baking sheet. Using a lightly floured rolling pin, gently roll from the center upwards in one motion, not pressing too firmly so taht any air bubbles stay intact. Roll from the centre down to the opposite end to form a rough oval shape, about 12 inches long and 8 inches at its widest point. Lightly cover adn let sit again for 20 – 30 minutes until it has risen. Use the tips of your fingers to press dimples over the surface of the dough. Lay the fennel and tomato slices on top. Drizzle with the remaining olive oil adn sprinkle with the salt. Bake in the preheated oven for 25 minutes. Carefully slide the focaccia off the sheet and put it directly on the oven shelf. Cook for a further 5 minutes, until the crust is golden. Remove from the oven and let cool before eating. Serve with a small bowl of fruity extra virgin olive oil for dipping. Adapted from market vegetarian by Ross Dobson.